We have now published our planned Thursday night dance-outs for 2018 which can be found on our Diary page. Keep an eye out for our new programme and website redesign all appearing soon. On Thursday 7th September we will now be dancing at the West End in Killamarsh at 21:00, and not the Duke of Leeds as previously advertised. This is in addition to the previously mentioned change of The Gate Inn at Troway replacing the Beehive on Thursday 14th September at 20:00. Unfortunately we have had to cancel our appearance at The Gate Inn in Troway, however we will now be dancing there on Thursday 14th September from 20:00 instead of at The Beehive. New photos and a video have been uploaded on our Flickr and YouTube accounts respectively from our Thursday evening dance-out (25th May) at Wortley Mens’ Club and our performance at a wedding held at Hassop Hall on Friday (26th May). Many thanks to Keith for taking them all. You can see slideshows/embedded video after the break as well as links to the respective pages. 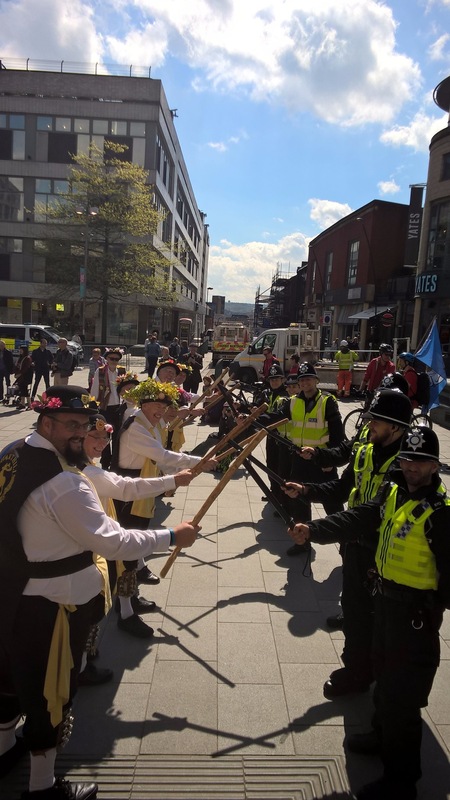 Yesterday we were one of 12 sides who performed in Sheffield City Centre for the Dance for St. George Day of Dance hosted by the Sheffield City Giants. We had a fantastic day in what was a great way to kick-start our new dancing season. Photos kindly supplied by Lesley Ellam from our dance-outs with the Three Shires ladies on Boxing Day 2016 have now been published on our Flickr account. The event marked the end of our 40th Anniversary celebrations and as such we performed the dances first learned by the side back in 1976. You can see a slideshow of the photos after the break, or click the link below to view the album. 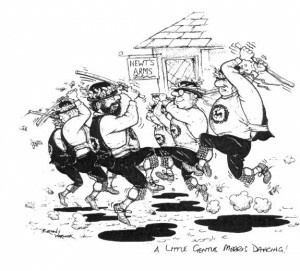 We have given our ‘Meet the Team’ page a bit of a spruce-up and added an all-new ‘Officers’ page that also includes lists of previous Old Men, Squires, Bag Men and Treasurers. 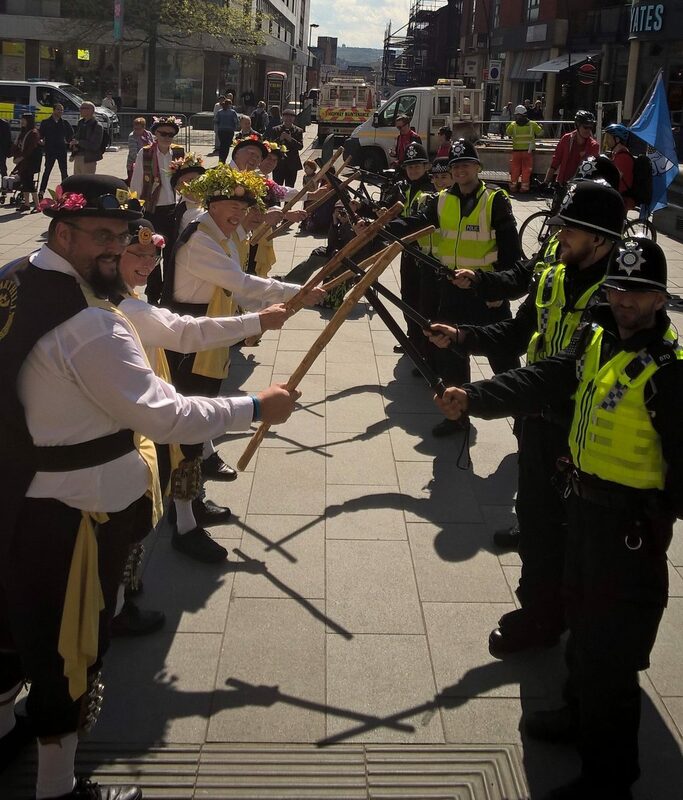 Recently we embarked on our traditional May Day tour accompanied by our sister side the Three Shires Ladies Clog & Garland Dancers. As this year is our 40th anniversary we decided to make this May Day a little bit more special. Massive thank yous go out to Harry, David G. and John L. for organising a wonderful day that was thoroughly enjoyed by all. The itinerary for the day along with a slideshow of some of the photos taken can be seen after the break. The day was rounded off with a wonderful Harthill Morris well dressing display and a birthday cake, photos of which you can see after the break as well, and a couple of presentations of engraved tankards made to outgoing officers Neil (Bagman) and Brian (Old Man).